Indian Navy invites application from Indian candidates for recruitment of Sanitry Hygienist posts. Course Commencining from April 2016. 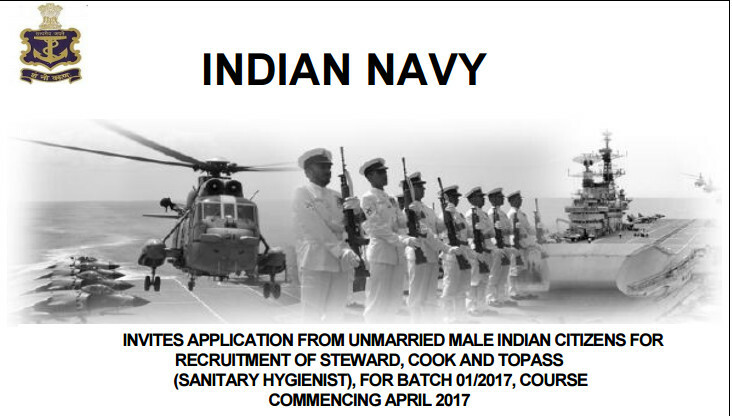 Age limit:- Candidates who are aged between 17 to 21 years as on 01 April 2017, are eligibile to join Indian Navy. Education Qualification and other criteria for different vacancies are given below. addition, they will also be allotted other duties for efficient running of organisation. Topass(NMR) Candidates who wish to join Topass post, should be 6th class pass. They will be required to mantain hygine in wash room and other areas. Lakshadweep & Minicoy Islands 04 Jun 2016. Where to send application form?